The symbol for Virgo is a letter “M” with a loop at its end. 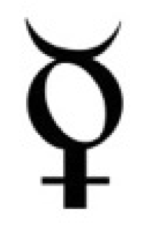 There are some discussions that this letter stands for “Maiden” but then Scorpio would have to be linked to it too. The loop in the symbol of Virgo does represent chastity, whether because it is seen as crossed legs of a woman or as a loop where no impurities can enter. In a completely different interpretation, we see that Virgo is represented through three similar obstacles or paths, the third completing the circle and taking a person back where they started. Just like a link between action and consequence through several steps, shown in the myth of Icarus, the symbol for Virgo represents our simple saying – what goes around, comes around. The sign of Virgo is ruled by planet Mercury that got its name by the Roman god of communication, eloquence, travelers, boundaries, trickery, luck and thieves. He was also the guide of souls to the underworld. Its Greek counterpart is Hermes, a messenger, quick and cunning, moving swiftly through the worlds of mortal and divine.